Mechanical Minds: KNOW WHY CARS DO NOT HAVE HOLES IN DISC BRAKE !! You might have observed that disc of the disc brakes of motorcycles have holes whereas disc of disc brakes of car don't have holes. Let us first know that why holes are provided in disc brakes. Yes, disc brakes when applied convert all the momentum into heat energy due to the frictional force because of which the discs heat up. Now if the discs heat up a lot more than they can handle, they will succumb under stress and result in a braking failure. This is the reason why there are holes in the discs to increase the surface area of the discs so that more area can come in contact with the discs to cool them. Yes, you might have a hard time to believe but the holes on the discs reduce as much as 300-500 grams off the bike’s weight. That actually might seem really less but translates into a lot when it comes to the performance of the machines. This is actually a much underrated reason but still an important one. Consider this, it is raining hard and your entire bike is wet including your brakes. Now if there are no holes on the disc, what would happen? There would be nothing to give the brake pads some edge to hold on it, the pads will get soaked up in water and the disc would remain all wet. When the brakes are applied the pads would simple connect with the disc and there would be no frictional force acting as there will be water lubricating the entire surface. Now just because there are holes, the brake pads are getting an edge there to hold on it, the edge of the holes scrape off the water from the pads and provide some frictional force to stop the bike. 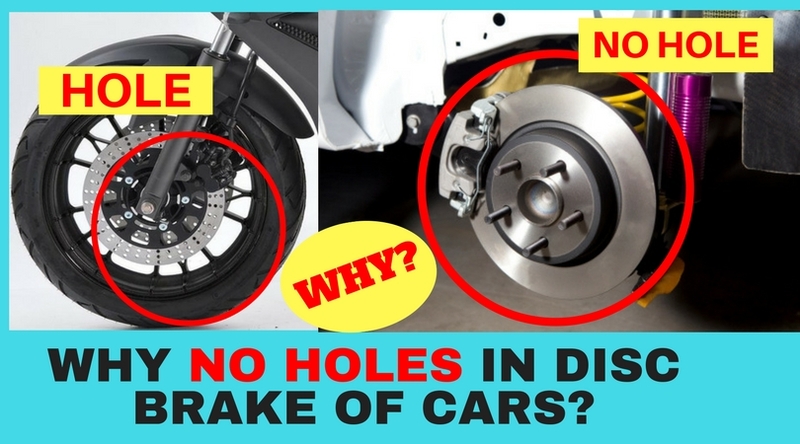 Why disc brakes of cars don't have holes in them? Mostly,In cars instead of Disc with holes a vented disc is used(as shown in figure above). In vented disc hollow spaces are kept in between two plates for heat dissipation.